Ardell Lash and Brow Accelerator is a product that works to repair weak eye lashes and restore thickness to thinning and over-tweezed or waxed eyebrows. The concentrated serum uses multi-proteins to increase growth as well as additional conditioners that work to soften dry, brittle eyelashes so that they are able to grow fuller, longer and thicker. The best way to use the product is to gently brush the serum on to the brows or lashes and leave it overnight before washing it off the next morning. Even though there are some rave reviews about the product effectiveness in lash growth especially among customers who have brittle and sparse lashes due to over-plucking or waxing their eyelashes, there is a consensus that the product used alone does nothing much for the lashes. 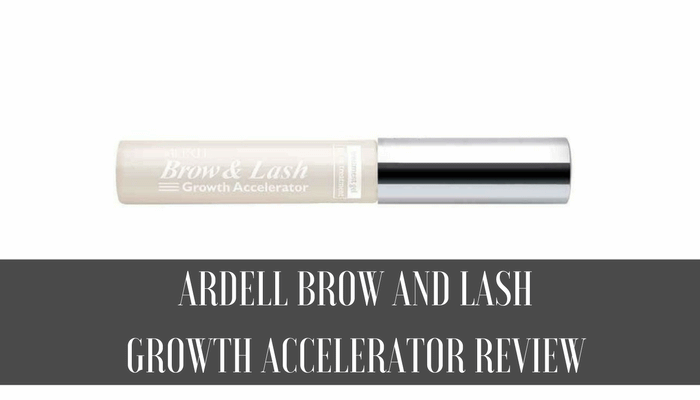 Ardell Brow and Lash Growth Accelerator is available for a steal at $3.99 making it the cheapest brand in this category of cosmetic product range. Unlike other products that focus only on one aspect of hair growth, Adrell Lash and Brow Accelerator both conditions and repairs. The product is hard to find in drugstores and often only available online. Shipping and handling fees often match the price of the product. The side effects of using the product include eye irritation and if the irritation persists, it is best to discontinue use and seek medical attention. The authenticity and genuine nature of some rave reviews are questionable. The key ingredient of this product is peony extract with some wheat protein that is never been heard of in any other products of this nature. It is made of 100% natural plant extracts and lecithin supposedly making it right for ultra-sensitive eyes. The ingredients that constitute this low priced product are water, Paeonia Suffruitcosa Extract, Panthenol, Polytetrafluoroethylene, Hydrolyzed Soy Protein, Hydrolyzed Wheat Protein, VP/DMAPA Acrylates Copolymer, Polyquaternium 37, Propylene Glycol Dicaprylate/Dicaprate, PPG 1 Trideceth 6, Ricinus Communis Seed Oil (Castor), lodopropynyl Butylcarbarmate, DMDM Hydantoin. The concentrated mixture of the above ingredients encourages the growth of new hairs to lend a thicker and fuller look to the lashes and brows. Like most eye products, Ardell Lash and Brow Accelerator can cause irritation if it comes in contact with your eye. If you have a scratched, infected or irritated eye already, these effects can worsen. If the product comes in contact with your eye, rinse immediately with water and contact a doctor if the irritability continues. Contact with the eye most often occurs when the product is being rinsed off in the morning. To prevent, try cleaning with a gentle eye make-up cosmetics remover. One thing that strikes immediately about Ardell Brow and Lash Growth Accelerator is that it is ridiculously cheap considering the price range of similar products of other popular brands. The next instant, you wonder if this low priced product does anything at all besides conditioning the lashes. Few have seen good results within 2 weeks of application but many have found no effect at all either in the appearance or in the length of the lashes even after applying the product for more than few months. Some customers have complained of eye irritation on the application site and acne around the eyelids. If low pricing is the lure for purchasing this product, it is prudent to consider the long-term effect it might have on your lovely lashes. Price should not always be a deciding factor when considering a purchase especially products related to your welfare. I was one of the ones who experienced eye irritation. I would apply this at night and when I woke up, my eyes hurt. Also, it caused the same bleariness that castor oil applied to the eyelashes does (wasn’t at all surprised to find castor oil in the ingredient list). I’ve been using it for two weeks already, going into the third week and I’ve honestly saw some great changes to my eyelashes. I haven’t applied it my eyebrows though, so for that I cannot give any feedback. I’m very happy with this product. Will now start putting it on my eyebrows as well! Just like the product review above, I was very skeptical as to whether it would work at all since it’s so cheap. Good to know that it works for me. Happy user here. I’ve used this product for a full month now. I’ve applied it to my eyelashes every night, and they seem to be a lot healthier than they were when I started the use of the product. My eyebrows seem to be healthier, but I’m not sure about the growth rate. All in all, I have to say I’m pretty happy with this product, as it’s so cheap. I’m quite sure if I would pay for a more expensive product unless results were explosive. this is not a good product it gave me eye bags . and saggi and is still like this after using for a month . I’ve been using this for 2 weeks now. So far, I notice my eyelashes are stronger & darker than they used to be. Usually whenever I take off eye make up, I will lose a few eyelashes. But since I’ve been using this, it reduces eyelash fall. Also, my eyelashes appear more voluminous as more tiny eyelashes growing from the corners of my eyelid (where it used to be a bit bare). However, I haven’t seen any dramatic extra length yet. Like this product – easy to use, not costly and my lashes & eyebrows look better – thicker, shiny & lashes are longer, but it does take a while to work(6 weeks). I read the instructions and used this product religiously, so very disappointed. It did not do a darn thing, but what can u expect from $3.99. Do Not waste your time on this product! Garbage!